Penguins are amazing birds that live in some of the most inhospitable locations on the planet. There are several threats to their lives in these conditions, so if you have ever thought how do penguins protect themselves, we are going to answer that question in this article. There are several risk factors that make it difficult for penguins to survive, but penguins are smart, and evolution has helped them in their survival. Let’s take a look at some of these risks that penguins face and how they protect themselves from these risks. Predators – Penguins have several natural predators in Antarctica and in the sea as well. Sharks, birds, leopard seals, and sea lions all hunt penguins of all sizes. Penguins deploy several defense mechanisms to escape from being hunted by these predators. For one, penguins often gather in large numbers that dissuade most predators. When entering the water, penguins do that in significant numbers so that it’s difficult for predators to focus on any single penguin. 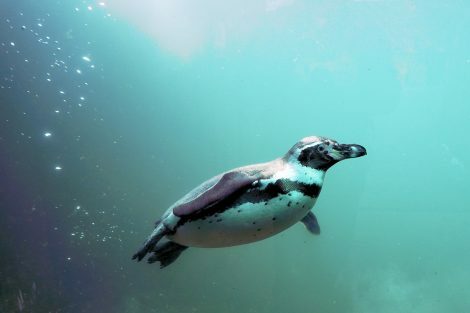 In water, penguins can swim fast to escape predators like sharks. The white feathers on their bellies make them look like the sky from below, and the black coloration on their back feathers make them look like a part of the water from above. This camouflage keeps them safe from predators in water as well as in the sky. When exiting the water, penguins time their exit with the waves to make an explosive exit so that they propel quickly out of the water and escape the reach of any sea lions or leopard seals waiting for them. This technique is called porpoising as it helps them to move out of the water at a quick pace. When trying to escape a threat on land, penguins often jump back into the water as they can swim away from the danger at a fast speed. Penguins are exceptionally agile underwater, and they use sharp turns and zig-zag motions to escape from predators in the sea. RIval Penguins – Penguins often face danger from other penguins in mating season or when they are taking care of their eggs. Sometimes penguins lose their eggs and they often try to steal eggs or chicks from other penguins. Other times, penguins will try to steal other penguin’s mate if their own mate has not returned to the rookery for mating season. Penguins can be aggressive when it comes to their eggs or their mates. Penguins will often fight other penguins by using their beaks and flippers to slap and hit the other penguins. As their flippers are solid, they can do ample damage. Penguins also squawk loudly to scare away other penguins from their nest. Bigger penguins might also push the smaller penguin by spreading their wings to look bigger and intimidating. Low Temperature – The temperature in the Antarctic region can fall much below zero in the winter season. 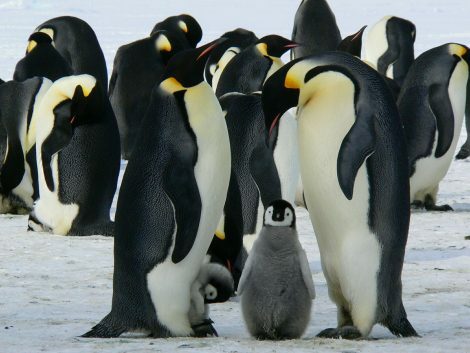 Emperor penguins bear the cold winter winds and they take care of their eggs in the winter season as well. Penguins have several survival abilities to weather the low temperatures. First of all, they have a layer of blubber under their skin that helps them to retain body heat and keep their vital organs safe from the cold winds or water’s temperature while swimming. Penguins can also trap air in their feathers that provides another layer of insulation against the cold. The dense feathers make it easy to keep air trapped close to their body. Penguins also secrete a kind of oil from their glands that they apply all over their feathers to keep them waterproof. Harsh Winds – The harsh winds in Antarctica can be brutal and unforgiving. Emperor penguins stay in Antarctica for the winter season and they huddle with other penguins to survive the cold winds. By staying in a huddle, penguins at the center of the huddle get warmth and protection from the harsh winds. After a while, it gets hot and suffocating in the middle of the huddle, so the penguins in the middle start moving outwards and the penguins at the edges of the huddle start moving towards the middle of the huddle. This keeps the huddle in a rotation and the penguins are safe from the fast blowing, cold winds. The huddles can include anywhere from a hundred to thousands of penguins. Starvation – When incubating their eggs, male penguins risk starvation for close to two months when they do not eat anything. To combat starvation, male penguins use the blubber on their bodies as a source of energy. By the end of the two month period, male penguins lose as much as 40% of their body weight. Some penguins often switch to eating fish instead of krill when they are hungry, and their preferred food source is not available. Adele penguins have also been observed swallowing small rocks and stones that some biologists believe is an activity that helps the penguins to combat starvation. Penguins are intelligent birds that use their biology and physical abilities to protect themselves from the threats in their natural habitat. One can even say that penguins have abilities that they have developed especially to survive while facing down threats that are dangerous to their existence. Other than natural risks, penguins also face threats from increasing human involvement in their habitat and this has created risks for them that they cannot counter easily. Rising pollution, oil spills, and decreasing supply of fish are some of the threats from that are detrimental to the life of penguins. These risks can only be countered by increasing awareness about these beautiful birds and providing them with a safe and secure environment to thrive in. So, if you ever wonder how penguins protect themselves, now you have the answers. If you have any questions or queries about penguins, please feel free to leave your question in the comment section. Our team will answer your question at the earliest.